Megan is part Shadow-Wolf, a breed reviled by the regular werewolves known as Draicons. Her kind are forced to live in exile, on an island, with their powers forbidden. But Megan has escaped and taken her two young cousins with her. She’s trying to find the girls’ father, in hopes of giving them a better life. But she doesn’t get far before Gabriel crosses her path. He is an Enforcer with a reputation to make any Shadow Wolf tremble. But after a short time in his custody, it becomes clear that his reputation is merely a ruse designed to hide the fact that he really a champion to Megan’s race. He’s been working for years to free her people with an underground railroad he has helped create. It’s hard for Megan to trust him, though. And things get even more complicated when the two of them discover they are really fated mates. That would be enough to deal with all on its own, but Gabriel’s organization has been compromised and someone is tracking them, targeting Megan, Gabriel or both of them. I found I really enjoyed this story… especially first two-thirds of it. Gabriel has a dark secret and some pretty serious self-loathing. (Have I ever mentioned how much I love a tortured hero?) And Megan has such potential to be the one person who can take away his pain and allow him to see the good in himself. She does make a pretty significant blunder that was hard to forgive her for… but these things rarely go smoothly. There’s a big cast of supporting characters, drawing on the obviously rich history of this series. I haven’t read any of the previous books, but I didn’t feel lost. In fact, I think I’d like to go check out some of the backlist if I ever get my TBR pile under control. A little over 4 stars. P.S. This book also included a previously published novella, “Darkness of the Wolf.” This story features two Draicons named Kayla and Guy. The two are tasked to track down a missing wolf whose pack has been destroyed, then deliver her to a new Alpha. Guy has been imprisoned for 30 years. If he succeeds, he’ll be freed. Kayla will get a hefty sum of money. Of course, when they are thrown together, they have no idea they are destined mates. But they find out quickly. 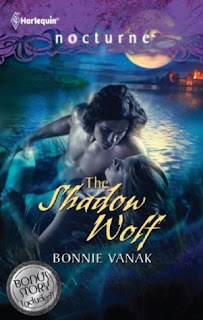 Guy has to convince Kayla to embrace the wolf in her that she turned her back on years ago; while she must break down the walls he has built around himself to survive prison all these years. As in most short stories, the relationship develops quickly, but it was both hot and sweet. A welcome bonus!